Planning on doing an Interrail trip? Not sure where to go yet? I know the feeling. In the Summer of 2017, I went Interrailing through Europe. Since Eastern Europe was still a 'unknown' area for me, I decided that that was where I wanted to go. I grabbed a map, did some research and looked for cities to add to my Eastern Europe Interrail route. I loved almost all the places that I visited. So here they are, cities to add to your Eastern Europe Interrail route! If you're planning on visiting Poland during your trip, go to Krakow! It has a beautiful historic center, there are multiple day trips to go on, lots of things to do and visit like the Wawel Castle and something I loved as well: everything is pretty cheap. What to do in this city? I wrote a post about things to do in Krakow. Zagreb is a small city, so if you want to go here, 2/3 nights will be fine. Walk around, visit the Botanical Gardens, eat ice cream at Vincek, go to the Dolac market and if you have some extra time, make sure to visit the Plitvice lakes. It's a bit far away, but definitely worth it! Prague, the capital of the Czech Republic. This city has to be on your route when you're Interrailing through Eastern Europe! Believe me. The atmosphere is great, the architecture is beautiful, the food is delicious (and not expensive) and there's enough to do. Perfect for a 2/3 night stay. Before I went to this city, I didn't know anything about it. But this was one of the cutest cities I visited during my trip. Ljubljana isn't a big city, but I recommend staying here for a couple of nights. Visit the castle on the hill, walk around the center or park Tivola, pay a visit to the market etc etc. Also, take the bus to Lake Bled! This beautiful lake is a must visit! I'm going to be honest, Budapest wasn't my favorite Eastern Europe Interrail Route stop. But nevertheless, I did have a good time. Relax at a spa, drink beers at a ruin pub (this was one of the things I liked most about Budapest) and enjoy the view from the castle/bastion. I'm happy I decided to visit Eastern Europe. It was all so different from the things I'd seen before. Interrailing is fun, exhausting and one of the best ways to see much in a short period of time. 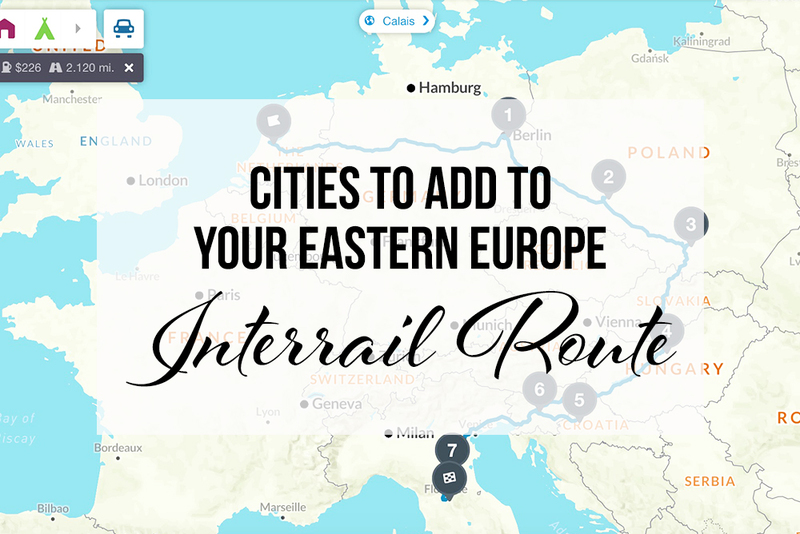 Have fun creating your own Eastern Europe Interrail Route! What cities in Eastern Europe have you been to? And have you been on a Interrail trip?